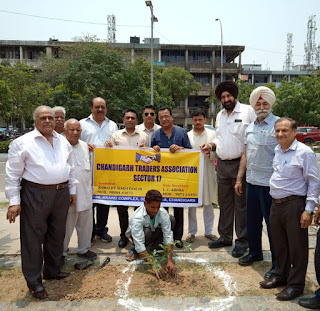 Chandigarh 05th June:- Members of Chandigarh Traders Association, Sector 17 Chandigarh, assembled at Sector 17 under the Presidentship of Kamaljit Singh Panchhi for a Tree Plantation Drive today on World Environment Day. This cause will also help in proving the problem of Global Warming. The Campaign aims creating awareness among people of Chandigarh for clean and green environment in Chandigarh and appeals to the Traders and general public to plant at least one tree at different places of the city. On the occasion Kamaljit Panchhi said by the next 10 years, earth will become four degree hotter than its now. Himalayan glaciers are melting at a rapid rate, so all of us lend our hand to fight global warming. Plant more trees, don’t waste water. Kamaljit Singh Panchhi further said that India is the global host of 2018 World Environment Day with “Beat Plastic Pollution” as the theme for this year’s edition, urges industries, individuals, traders, communities to come together and explore sustainable alternatives and urgently reduce the production and excessive use of single-use plastic polluting our oceans, damaging marine life and threatening human health. On this occasion members pledge that everyone of us does at least one green good deed daily towards our Green Social Responsibility, there will be billions of green good deeds daily on the planet. Kamaljit Panchhi appeals to citizens of the city stop using plastic, Beat Plastic Pollution, less poison, sensible use of non- renewable things to give a better earth to generations to come.